We are deeply saddened to announce the death of Suzuki Roshi’s widow, Mitsu ‘Okusan’ Suzuki, early Saturday January 9, 2015. The three temples rang the densho 108 times that morning, and each temple held a memorial service to honor her passing and express gratitude for her teachings and her presence in San Francisco Zen Center. 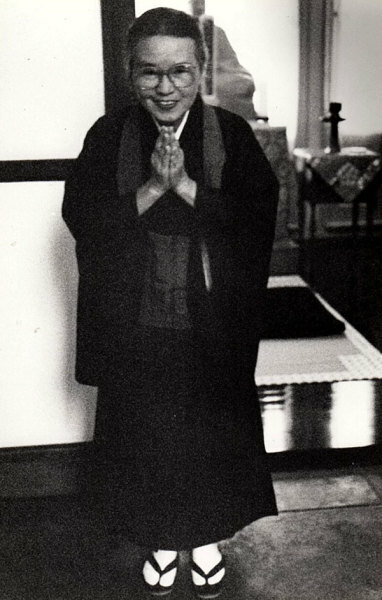 Our photo shows Okusan standing outside the Founder’s Hall�in City Center where students honor�SFZC founder Suzuki Roshi every month with a two-part memorial service, the evening of the 3rd and the morning of the 4th (he died December 4th, 1971). This was Okusan’s last memorial service in San Francisco before she left for Japan in October 1993.